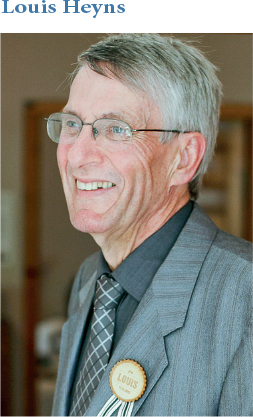 Dr Louis Heyns, a member of the Department of Paediatrics and Child Health at Tygerberg Hospital and Stellenbosch University (SU), died in tragic circumstances in May 2013 at the age of 59 years. After matriculating at Tygerberg High School in Cape Town in 1971, Louis undertook his medical studies at Stellenbosch University, obtaining his MB ChB degree in 1977. He did his military service from 1979 to 1981, serving in missionary hospitals and at 2 Military Hospital in Cape Town. He obtained the Diploma in Child Health of the College of Medicine of South Africa in 1986, a Diploma in Community Health at SU in 1988, BSc Hons in Epidemiology and Statistics at SU in 1990, MPhil in Maternal and Child Health at the University of Cape Town in 1996, and MPhil in Health Sciences Education at SU in 2011. Louis worked in the Paediatric Intensive Care Unit at Tygerberg Hospital for 30 years, initially as a medical officer and subsequently as a consultant. During this period he provided outstanding service to countless children, and was responsible for the postoperative care of numerous children who had undergone cardiac surgery. He taught many generations of paediatricians the skills required to look after critically ill babies and children. He- was also a vitally important member of the Tracheostomy Unit and the Tracheostomy Home Care Programme at Tygerberg Children's Hospital. Louis was passionate about teaching. He was involved in both under- and postgraduate medical education at SU, and served as an examiner in the last two Diploma in Child Health examinations of the College of Paediatricians of South Africa. An experienced Advanced Paediatric Life Support (APLS) instructor, one of his passions was teaching resuscitation skills to students, doctors, nurses and paramedics. Louis loved to help undergraduate students develop their potential. He was active in student outreach activities and spent many weekends away from home helping students deliver healthcare to impoverished communities. To develop these outreach activities optimally, he served as a board member of the Matie Community Service. He was greatly admired and loved by the students as a mentor and for his dedication to these activities. He was chairman of the Tygerberg Hospital School Board as well as the Departmental Occupational Health and Safety representative for both the hospital and the medical faculty. At the time of his untimely death, Louis was the diplomate representative on the Council of the College of Paediatricians and had served on the Senate of the Colleges of Medicine of South Africa in the previous triennium. Louis was an amazingly caring person, well loved by patients, parents, students and staff. His love for all living creatures was evident in the numerous animals he rescued and nursed back to health. His passing has left a massive void in paediatrics in South Africa, and in our hospital and department in particular. He is survived by his wife Dalene, his daughter Eldalé and his sons Charl and Daneale.